This is a story of something like survival. Sal planned it for almost a year before they ran. She nicked an Ordnance Survey map from the school library. She bought a compass, a Bear Grylls knife, waterproofs and a first aid kit from Amazon using credit cards she'd robbed. She read the SAS Survival Handbook and watched loads of YouTube videos. 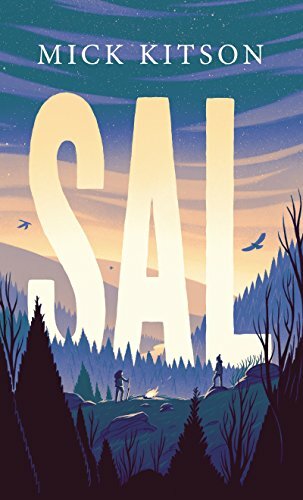 Told in Sal's distinctive voice, and filled with the silent, dizzying beauty of rural Scotland, Sal is a disturbing, uplifting story of survival, of the kindness of strangers, and the irrepressible power of sisterly love; a love that can lead us to do extraordinary and unimaginable things. Sal is with her little sister Peppa in the book by Mick Kitson. Sal is 13 and her sister is 10. They are “surviving” on their own in a somewhat remote part of south west Scotland. Sal has prepared their escape. Sal is excitable and knowledgeable about survival though mostly from YouTube videos. The reason for their escape is revealed quite early on in the book. The voice of the book, Sal’s, seemed a little strange initially. As the story develops however we learn more and more about Sal and the narrative style makes more sense. There are times when this is quite a hard book to read. It can be quite dark in its way. That darkness is mitigated by the writing I think. The story felt understated at times when for me it should have been even harder hitting. That said my eyes were unaccountably damp sometimes! It does feel as though the narrative rambles at times. Often it is with Sal in current time however it frequently goes back to past experiences she has had or to the planning for their escape. The more you find out about Sal the more it all makes sense. There are a couple of other characters in this story. “Maw” is someone who takes little explaining allowing the ability to understand some Scottish accent! There is another character called Ingrid who is important to the tale. I understand why there is a need for her however there are times when she did seem to dominate the story. I would never have thought of stopping reading this and I guess I was fairly convinced by the story however not completely. Equally though I don’t think it ever quite gripped me in the way I thought it would. I guess that there is a fine line between powerful and naive and something more contrived. Very readable and probably over 3.5/5 for me.